Rescuers carry a survivor of a collapsed mine on a stretcher in Bolaang Mongondow, North Sulawesi, Indonesia, Thursday, Feb. 28, 2019. Rescuers have passed water and food to some of the dozens of people trapped in a collapsed Indonesian gold mine, an official said Thursday, calling the grueling rescue effort a race against time, in the remote inaccessible location. Rescuers brought an excavator to the remote Indonesian gold mine that collapsed earlier this week, trapping dozens, hoping to speed up rescue efforts despite the risk of triggering landslides. 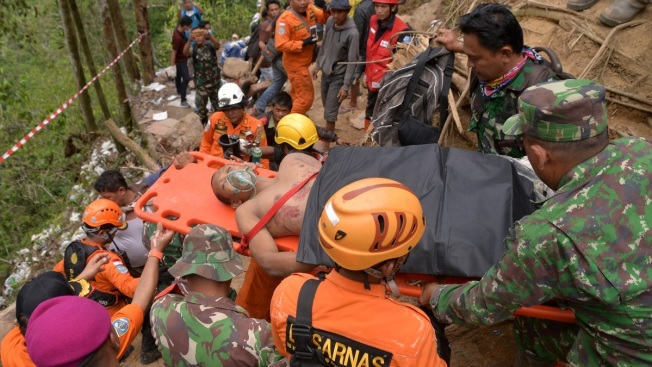 The death toll has risen to eight and 20 have been rescued, local disaster official Abdul Muin Paputungan said Friday. About three dozen people are still believed trapped in the rubble of the unlicensed mine in North Sulawesi's Bolaang Mongondow district that collapsed on Tuesday evening. Paputungan said an excavator began working on the site Friday morning after relatives gave permission and a path was cleared through steep jungle terrain. He said the dozens of emergency workers involved in the grueling rescue "never stop praying that all those still trapped in the mine are able to survive until we can rescue them." Food and water has been passed to some of those trapped but officials are concerned oxygen is dwindling in parts of the mine. Rescue workers have used makeshift stretchers to haul victims to a nearby settlement. Wooden structures in the mine collapsed Tuesday evening due to shifting soil and the large number of mining holes. Informal mining operations are commonplace in Indonesia, providing a tenuous livelihood to thousands who labor in conditions with a high risk of serious injury or death. On Thursday, a trapped miner's leg was amputated to free him but the man died from blood loss while being carried out of the area. A rescuer who amputated the leg of miner Teddy Mokodompit said he and his team crawled 12 meters (40 feet) into the mine to operate, Kompas newspaper reported. The stuffy air was difficult to breath and the tunnel they were in vibrated, with soil and gravel falling on them, Laiya, who uses one name, told the newspaper. "I and all my team members were crying while cutting his leg in the hole," he said. "We were worried that landslides will happen while we were inside." The national disaster agency said more than 200 people from multiple agencies are involved in the rescue but frustration was growing among family members of trapped miners. A recent study suggests that a man's beard contains more germs than a dog's fur. All 18 men's beards studied by researchers at Switzerland's Hirslanden Clinic had higher levels of bacteria in them, compared to only 23 out of 30 dogs. 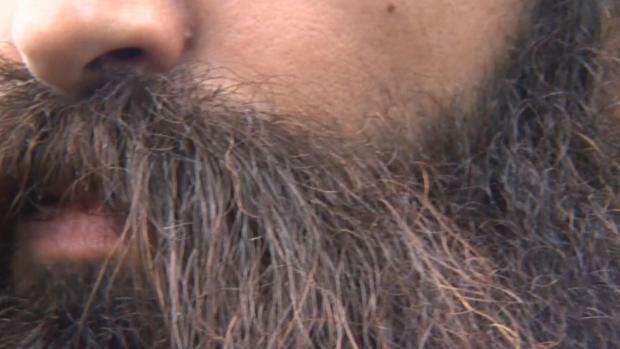 Some beards had so much beard bacteria the men could get sick, the study says. "The process to rescue only one person takes the whole day," said Amin Simbala, father of a buried miner. "Don't be concerned by this one person only, just get him out, if you need to amputate then amputate so others can still be saved." Rescuers have used their bare hands and basic tools to search for the missing. They've fashioned stretchers from tree branches, twine and other material. Photos showed a trapped miner's arms and head jutting through a gap in rocks and rescuers toiling each night in arduous conditions. The search and rescue operation is difficult not only because of the remote and inaccessible location but also because of the risk of triggering new collapses inside the mine. Small artisanal and often unauthorized mining is rising in many parts of Asia and Africa. A study by the Intergovernmental Forum on Mining, Minerals, Metals and Sustainable Development found the number of people engaged in such mining had risen to more than 40 million, up from 30 million in 2014 and 6 million in 1993. Landslides, flooding and collapses of tunnels are just some of the hazards. Much of the processing of gold ore involves use of highly toxic mercury and cyanide by workers using little or no protection.